My family loves pizza. We eat it pretty much every week. Right now we are on a pizza for Sunday dinner kick. At around 3 pm I turn on the bread machines and by diner time we have a fabulous feast of homemade better than takeout and can’t even be compared to frozen, pizza. The recipe I use has been adapted from The Bread Lover’s Bread Machine Cookbook, which I picked up at a yard sale one summer and love. 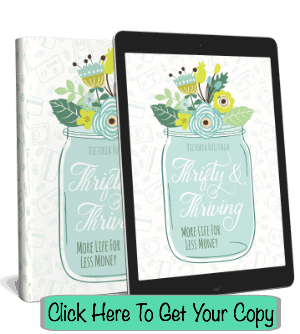 Its full of 300 bread machine recipes, for everything from bread to jam. Place all the ingredients in the bread machine and use the dough cycle. An hour and a half later you will end up with pizza dough like above (remember I own two machines, so I get two mounds of dough). 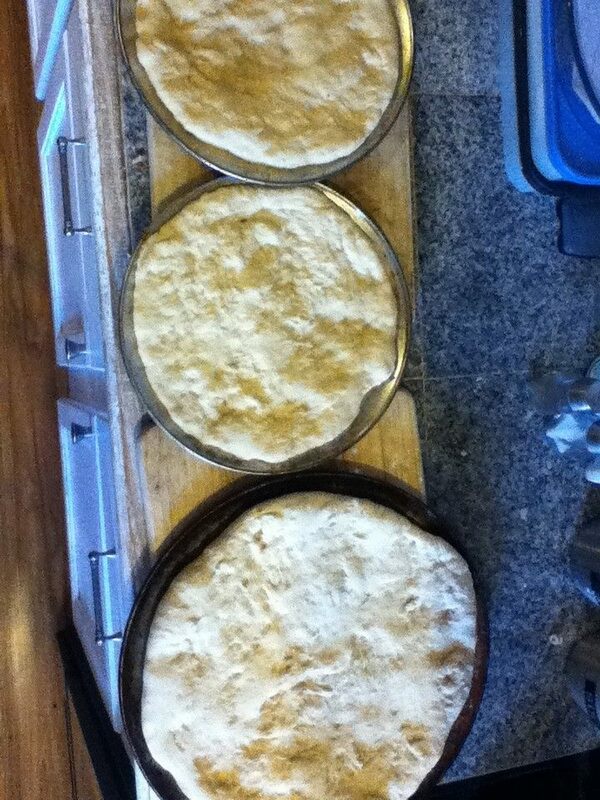 I like to wrap a bread board in wax paper and cover with flour and place the dough on that to rise. That way I am insured that the dough will not pick up anything from the bread board, and it won’t stick to it either. At this point. 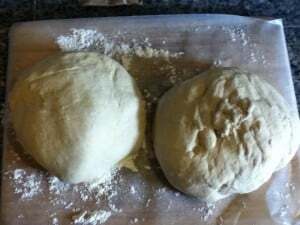 Cover the bread dough with a cloth and let rise for 30 minutes. 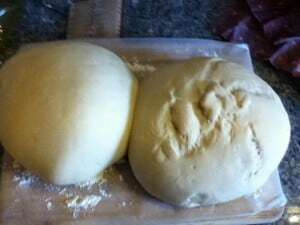 Your dough should be noticeably larger in size.Go ahead now and preheat your oven to 450 degrees. 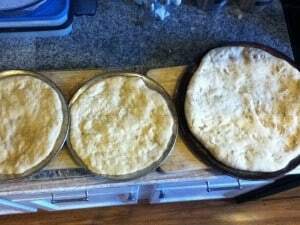 Divide up the dough according to the pans you have, and pull and stretch the dough with your hands to fit. A quick word on pans. I know some people prefer baking stones, which I love for biscuits and cookies but I find that my pizza crust gets crisp on the outside, and chewy on the inside using a stone. I know others use cast iron skillets, and I have yet to try this. I have eyed a rather large one over and over, but just have not made that expense a priority. But I have had it cooked that way by others and it is yummy. For now I use metal pizza pans, which I grease with olive oil before using. They cook very evenly and can be purchase rather inexpensively. Or if you wish just use your metal cookie sheets. Once your dough is stretched evenly to the size of your pan, and your oven has reached 450 degrees, it is time to prebake the crust. Place your pizza dough in the oven and set the timer for 5 minutes. While your crust is prebaking, go ahead and get out all the toppings you desire. When timer goes off, get the pizza’s out of the oven and top. You will end up with very scrumptious pizza. I almost forgot to take a picture of the completed pizza, so that is why a piece is missing. On pizza night, my family runs to the table and can barely wait through prayer time to dive in. As it was, I had to slap hands away so I could get this picture. take out of oven and then let cool for 5 to 10 minutes before eating. YUM! This looks good! I used a cast iron skillet a couple of weeks ago to make pizza in with my gluten free artisan bread… It was really good! My family loves pizza too, but it’s been a long time since I’ve made a homemade version. I think it’s time to get my bread maker out again and give your recipe a try. 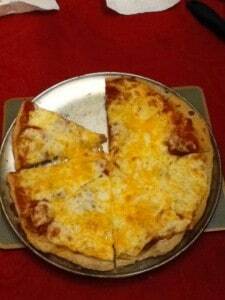 I use a large, non-stick metal pizza pan that is perforated to let the crust crisp up. I really like it. Can you freeze this dough to use for later? It is delicious by the way! It is a hit with the entire family. Thanks! Yes. We have frozen it in the dough stage just fine. Thanks for the review! I am glad your family enjoys it. We like thinner buttery pizza crust i find the machine dough to be to hard to handle. any suggestions? We buy a box that stores do not carry any more Alpine way so we are struggling to find a replacement. My husband seems to get it really thin with a rolling pin. As for buttery, you could try brushing melted butter on it. If you like it crispy you could pre-cook the crust more before putting the toppings on. It would just be a matter of experimenting until you get it just the way you and your family like it. Will try this, looks good and I love to use my bread machine. One question, when do you form the dough before or after the rise ? 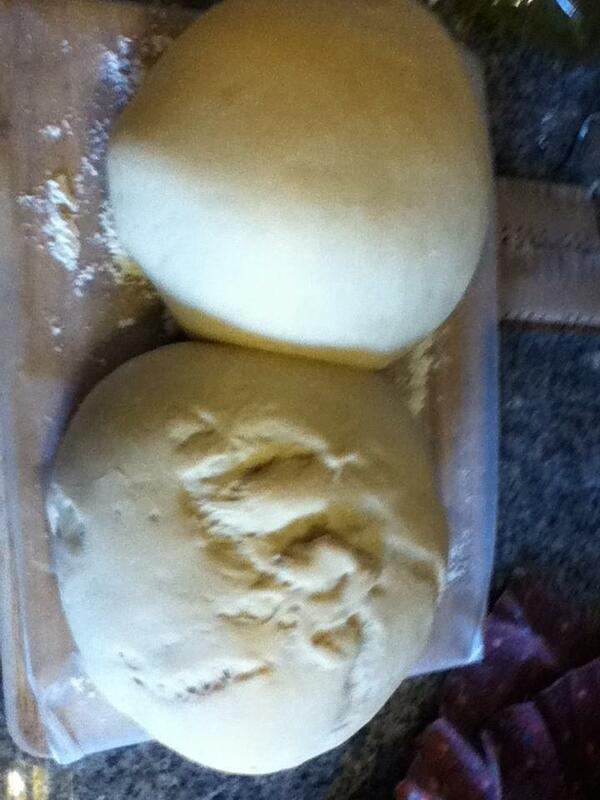 I form the dough after it rises. I hope you enjoy the recipe as much as our family does! The olive oil has no mesurement. 1/4 what? Cup? 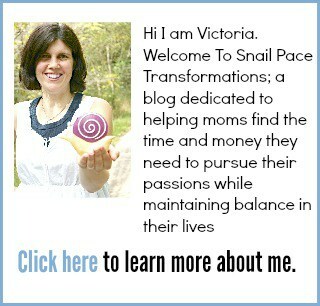 Every other recipe I use uses Tablespoons, is it 1/4 Tablespoon? Sorry about that–I fixed it. It is a quarter cup.